Flexible classrooms look and feel different from traditional classrooms. Desks are replaced with a variety of learning spaces that allow students to sit, stand, recline, wiggle, and collaborate. Justin Ingham, a third-grade teacher at Gatewood Elementary, was in his 14th year of teaching when he decided to do something completely different. Inspired by a presentation his colleague gave during workshop week, he became interested in creating a flexible classroom — a fluid space that allowed students to customize their learning environments. It was one week before the first day of school, not exactly the best time to tear apart your entire classroom, but it was now or never. And one thing was clear: If he was going to build this environment, all of the desks in his classroom needed to go. Ingham's first flexible classroom was bare bones and made mostly with extra furniture he found in his school's back hallway. A few months into his experiment, his classroom was chosen as a pilot site to test out flexible furniture. But the change is bigger than removing the desks and replacing them with fun furniture — it's about the learning that happens when you change the classroom environment. "This is not about furniture, it's about the psychology that is behind this," said Karen Terhaar, director of teaching and learning for Hopkins Public Schools. "When you have a lot of open space, there is a peacefulness to the space that changes how students respond." Flexible learning spaces are just one way that Hopkins Public Schools is pushing past the traditional classroom model and exploring innovative methods that remove barriers, deepen engagement and critical thinking, and allow students to take ownership over their learning. "Once the idea of an assigned seat is out of the picture, I am allowed to trust my students and engage with them where they are, instead of trying to manage where they should be — it strengthens our relationship," Ingham said. One year after he made the change, Ingham has no plans of returning to a traditional classroom. He is now part of a grassroots movement sweeping across Hopkins Public Schools as teachers at every level are embracing flexible classrooms to improve student outcomes. The District plans to continue to support teachers who have an interest in transforming their classrooms. "This is a model that is growing organically District-wide as teachers watch the transformation in their colleagues' classrooms," Terhaar said. "It is our hope to nurture this interest in creating flexible spaces and support teachers in the continued effort to transform their classrooms to better meet the needs of students." Flexible classrooms look and feel different from traditional classrooms. Desks are replaced with a variety of learning spaces that allow students to sit, stand, recline, wiggle, and collaborate. Throughout the day, students can roam freely around the classroom, rotating to the learning space that works best for them. All of this means students have greater ownership over their learning and can participate in it with greater frequency. "The goal was to give students choice," Ingham said. 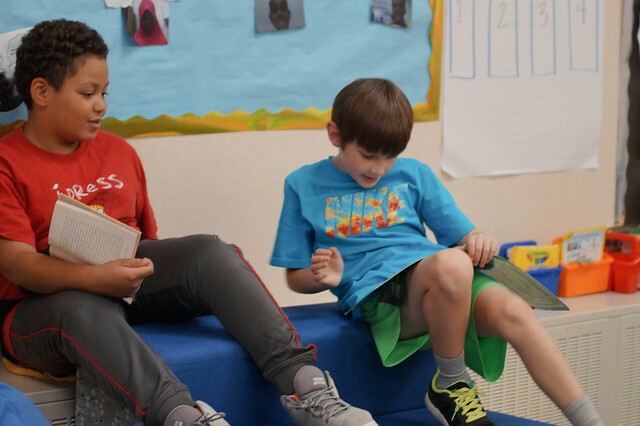 "I want to increase the engagement of my room to 100 percent, and with a flexible classroom, I am getting more quality work from all my kids, and the engagement is much higher." Hopkins teachers began exploring flexible learning spaces a few years ago. The secondary level implemented flexibility differently because students rotate spaces more frequently. Some classes contain a hybrid of flexible seating and traditional desks. North Junior High introduced flexible furniture in its media center and the gifted and talented Autonomous Learning Model (ALM) class used these concepts long before there was language for it. Tracey Beaverson, now a teacher at Meadowbrook Elementary, was one of the first elementary teachers to pioneer this shift in her classroom. It was an idea she heard about in HopDina, a professional development cohort that serves Hopkins and Edina public schools. Teachers were grappling with how to teach in classrooms that were designed to prepare students for industrial work. Collaboration is now critical in the classroom, and a technology-rich curriculum means that the teacher is no longer the only source of information in the room. The learning environment needs to reflect the learning expectations. "We are changing our teaching styles, but the room was stagnant," Beaverson said. "I would move kids around and change desks, but it was not easy, and it was not conducive to the collaborative, creative learning environment I was trying to produce. At the elementary level, when young kids are in one room for most of the day, desks can be problematic. Ingham estimates that at least half of his kids struggled to sit still in the same spot all day. A flexible learning space acknowledges the need to move and allows the student to choose the space they need to stay engaged in their work. It empowers both the students and the teacher.